I’m no Jacques Cousteau, but for a brief while I felt as if I might have been. Gliding by just a few feet below me was a several-hundred-pound manta ray, his winged silhouette illuminated by bright lights shining down from the water’s surface. Tim is one of numerous manta rays that come to feed in a cove off Hawaii’s Kona coast, one of the few places where you’re almost guaranteed a sighting. The ocean dwellers—whose wing spans generally range from three to twelve feet—know that a buffet awaits them there each evening. The lights in the water attract plankton, which in turn make a tasty meal for the manta rays—and great spying ground for snorkelers and divers. In fact, a nighttime snorkel in these waters is touted as the experience of a lifetime: witnessing the graceful, ballet-like movements of the manta rays as they turn and twirl to get their fill of food. It could very well be the experience of a lifetime…if the manta rays show up. On the night we donned wet suits and snorkel gear and jumped into the Pacific after dark, Tim turned out solo to dine and wasn’t interested in pirouetting. Big Bertha and his other cohorts were nowhere to be seen. 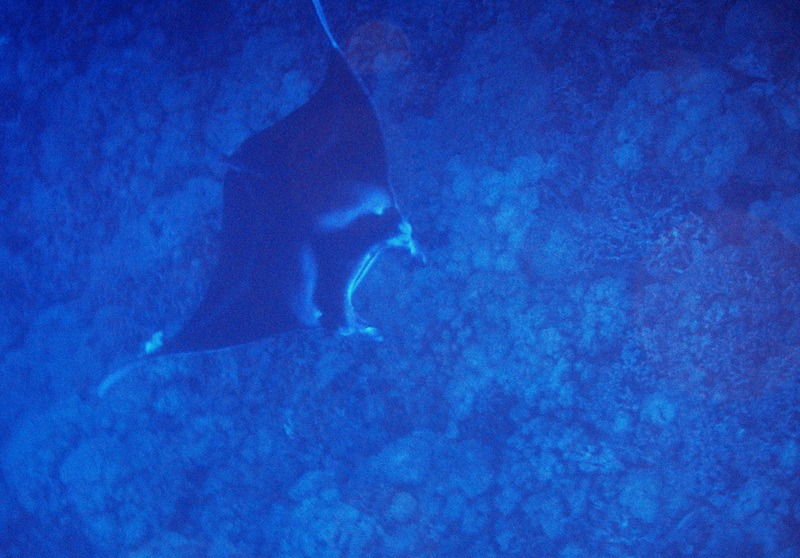 Despite the dearth of manta rays, it was nonetheless a memorable experience. 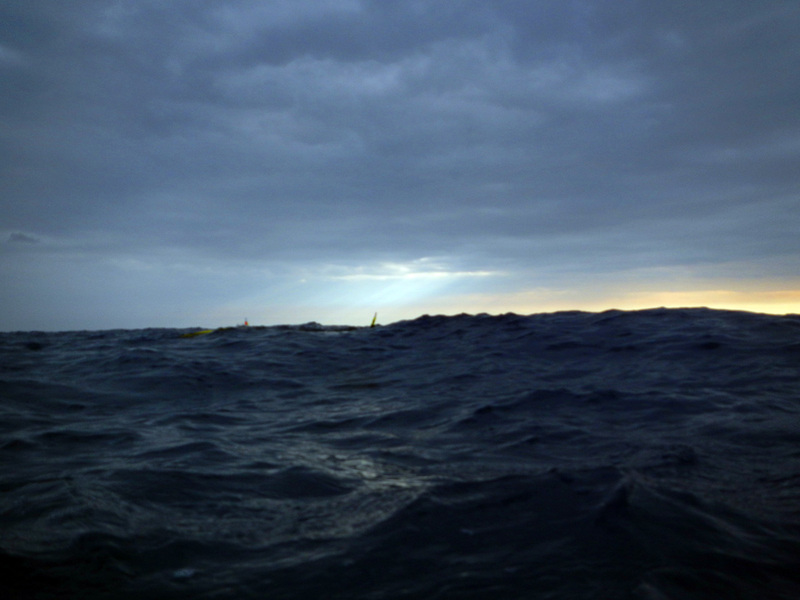 Being out on the water at night was surreal, far enough from shore that the pitch black was punctuated only by lights set up by our tour company and others that congregated in the area. The atmosphere was surprisingly convivial, with music playing while we snorkelers clutched a ring to steady ourselves as we watched the underwater show, including schools of silvery fish going about their business. It was our second time in the water that day. If you’re new to snorkeling (like me) or nervous about the activity (like me), I recommend an outing with Big Island Divers. For an additional ten dollars per person ($99.95) you get a double header on the Twilight & Manta Ray Night Charter. They ferry you out in the late afternoon to snorkel, a warm-up that allowed me to get comfortable in the water before taking the nighttime plunge. Tim turned out earlier in the day, too. We got a sense of how gargantuan he really is by seeing him next to our group’s sole diver, who looked miniscule in comparison. Now, if you’re quaking as you read this, rest assured that I’m not terribly adventurous and, in fact, have a particular fear of sea creatures. But even from my brief experiences snorkeling I’ve come to realize they don’t have all that much interest in humans. Plus, manta rays are referred to as “gentle giants” because they have no teeth and no stingers. Each one is uniquely patterned with spot markings on its underside, distinct enough that our tour guides can identify them individually. They’ve even been given names by local conservationists. Like Tim, who played his part, giving us an up-close look at one of these magnificently awesome beings. Thanks, Tim. You made my night. Excellent post. Taking a plunge with Mantas is one of my diving dreams (I have an ear problem so I want to save any remaining dives for stuff that is truly worth it). I didn’t know that it was possible to do just with snorkeling. There are places you can do that in the Philippines so I’ll try and do a Manta snorkel later this year. Thanks for an informative post! Thank you! Neither of us dives, but we found the snorkel to be an excellent vantage point for seeing Tim, at least. I imagine it’s quite magnificent if more of them show up, as I believe they come quite close to the snorkelers and divers. I would definitely do this again, hoping to see more rays; 28 recently turned out one evening, which was no doubt a sight to behold. 28. Wow. That almost warrants a trip to Hawaii just to experience it!! I’ve never snorkeled with rays, but I would definitely give it a go!! I’ve swam with manatees, they are also gentle giants, but are very inquisitive. I wanted to cage swim with the sharks when I was in Oahu but my husband just wasn’t up for it, haha. I’d love to swim with manatees. Maybe that will be next since I’m slowly but surely getting over my fear of sea creatures. Although white sharks are a whole different thing! I would like to do the cage swim at some point, though, if I can work up the nerve.